The trip courtesy of Republica del Cacao started in Guayaquil, a coastal town. The first part of the trip consisted of visiting the cacao plantations. Our guide Jaime told us how his family and others have been growing cacao here for generations. He showed trees that were 70 years old and still growing amazing fruit. They grow mostly Cacao Nacional, a very precious type of cacao. Walking through the plantation, seeing how the cacao trees flourish underneath a canopy of other plants and the way the farmers work the land here in the most natural way possible was truly a humbling experience. We went back to our bus in colorful tuk-tuks and on to Republica del Cacao's main collection center. Entering this space, a restored XIX warehouse, gave us a feeling of what colonialism must have been like. Republica del Cacao has done something wonderful: they have taken this historic space and managed to organize it in the most efficient way possible for their own use while still maintaining its aesthetic charm. My architect's soul was pleased to see how they truly made form follow function in a sound way. I was impressed by the way they used materials and structures of the area. Of course, their main focus is processing the cacao. Every step of the process is done meticulously and looking to make the best quality product. At the collection center we were offered a delicious traditional lunch, served with tomato de arbol juice and a lot of local fruits. The rest of the day was spent on the road (and sky) to Quito. We stayed at an inn in Cayembe. On Tuesday, we had to get up before dawn and it was very cold. Back on the bus, we went up into the Andean mountains. The scenery now was Swiss-like, even though the mountains in the background were actually snow-tipped volcanoes. They were taking us to milk cows. 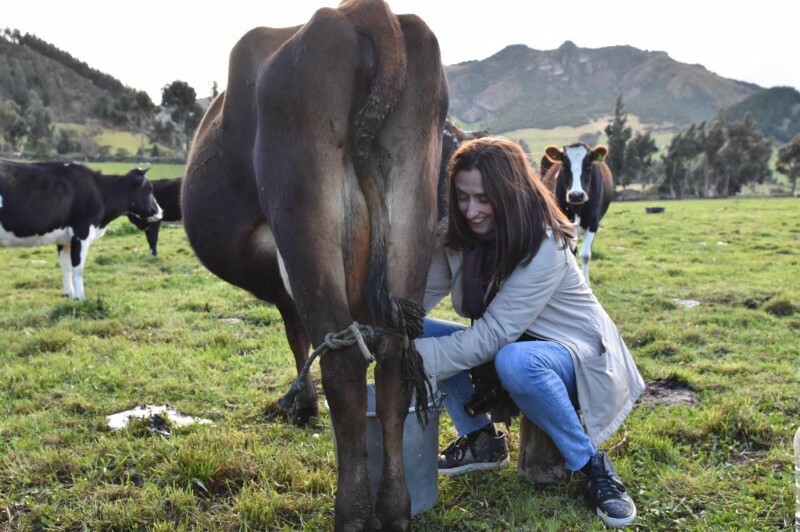 Republica del Cacao uses milk from the happiest cows on Earth, said Bramley. We met Freddy and his "cowgirls" who are in charge of tending to the cows. The cows are on a steady diet of grass, grains and white clovers for protein. After milking the cows, we left our cow Pili and her friends and went to the milk collection center. It was early enough that we met a group of children going to school. Our guide and RDC community ally Jose had come prepared and and gave them a big bag of white chocolate to share. This chocolate was made with the milk from the cows that we had just milked. Back at the inn in Quito, we had a very welcomed breakfast and some of us went to explore the artisan marketplace. That night we were treated to a very special cocktail and dinner with top RDC representatives, including their CEO. Each dish was made with local ingredients and variations of chocolate and cacao. Afterwards, our super organizer Gaby had a surprise for us. Let me just say there was music, but no mariachis. Our little group of chocolate and cacao misfits was slowly growing together. For me, each person brought something to the table. They were all humble, generous with their knowledge and eager to keep learning. Wednesday was a little sweeter. We went to the cane sugar plantation. It was not at all like the ones i have seen in Venezuela. The panela has an entirely different flavor. We started the journey backwards, from the end product first. They take the cane juice and cook it until, thanks to "el milagrito" (little miracle), it becomes a powder. From the moment you step in and inhale, you know this place is special. These are smells that will remain with me forever and that hark back to childhood memories of going to the hacienda with my cousins as a little girl. Following this backwards road, we now went to the sugar cane fields in the land of the late Fabian Guerron. Here, you can appreciate the effort of hardworking people making a high quality, sustainable ingredient. I have to add that during the visit to the fields we were treated to licor de caña (cane spirit), so that we were all very refreshed and happy by the end. The last day was the one we were all most looking forward to. We were finally going to visit the RDC chocolate factory in Quito. Even though I was very vocal (maybe too vocal...?) in saying that Venezuelan cacao is the best in the world, the big deal here is how they process the cacao and their constant quest for excellence. This Willy Wonka factory, sorry, RDC factory is different from others. Each worker showed a great degree of professionalism and they have all been working at the factory since it opened 4 years ago. The same can be said of the top executives. Again, we could appreciate the attention to every single step in the process. The visit ended on a high note with an expertly guided tasting of RDC products. Tasting chocolate under these conditions, surrounded by the smells and atmosphere of the factory, was a unique experience. We got to go on our whole trip again, in a way. The chocolate was made with beans from the farm we visited. We could taste the grass Pili and the other cows fed on in the milk and white chocolate. And the 65% chocolate was sweetened with the panela we had tried the day before. I was nostalgic for Venezuela during the entire trip. I was struck by the thought that all this should be possible in my country, especially because there are dedicated and talented people making chocolate there. Yet the government keeps putting obstacles in their way. Making chocolate in Venezuela is a gigantic undertaking and companies like El Rey and Franceschi are working against the odds. I just wish things were different. I want to thank everyone who came on this trip and those that made it possible. It was a week of personal growth and inspiration!